It is an astonishing Summer Exhibition 2011 at the Royal Academy opening the 7th June until the 15th August 2011. This event is at its 243rd edition. It is also the world’s largest open submission contemporary art show. The Summer Exhibition always raises a sort of traditional debate, probably ongoing since the show itself.The Summer Exhibition 2011 carries on the tradition of displaying works by both emerging and established artists in all media including painting, sculpture, photography, printmaking, architecture and film. One of the founding principles of the Royal Academy was to ‘mount an annual exhibition open to all artists of distinguished merit’ to finance the Royal Academy Schools. This has been held every year without interruption since 1769 and continues to play a significant part in raising funds to finance the students. The Royal Academy receives no public funding. By submitting works, visiting and through purchases at the Summer Exhibition people can contribute to support artists of the future. The Summer Exhibition 2011 faced a great number of applications with over 12,000 entries, arrived from 27 countries all over the world of which the selection on display is of 1,031 pieces. The majority of works are for sale. The spaces in the Royal Academy have a new approach to a traditional “salon hang”, counting a mix of open submission works as well as artworks by Royal Academicians. This year’s co-ordinator is RA Christopher Le Brun. This edition is organised in fifteen rooms, each one in an open contrast, or completely disconnected, from the followings. Each room has a dedicated curator or more. 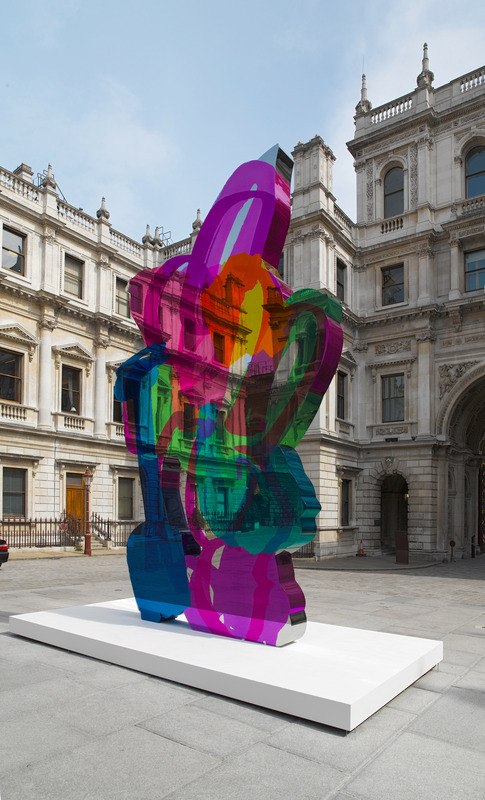 ‘Coloring Book’ (2011) by Jeff Koons opens the show, occupying the Annenberg Courtyard. The Wohl Central Hall, arranged by Michael Craig -Martin, welcomes visitors with notably photography. Room I and II celebrate stylistic diversity according to Chris Orr who arranged them. The Small Weston Room and the Room VII are arranged by Olwyn Bowey and are prevailed by landscapes, still- life and unpopulated interiors. The Large Weston Room displays the pain of the war, hung by Stephen Farthing. Painted in warm dark grey Room III is hung by Christopher Le Brun and Tony Bevan. Sadness is the subject of Room IV, arranged by John Wragg. Room V is “only for people who are sensitive, intelligent and thoughtful” organiser Tess Jaray said. Architecture is in Room VI, coordinated by Piers Gough and Alan Stanton. Room VIII is arranged by Michael Sandle who is keen to ‘war’ its main interest. Room IX is hung by Christopher Le Brun, Tony Bevan and Stephen Farthing. Arranged by Maurice Cockrill, Room X explores abstraction and social commentary. The Lecture Room, the last one arranged by Michael Craig -Martin, is a space dedicated to major Royal Academicians. The exhibition is sponsored by Insight Investment. A Memorial of Ben Levene (1938 – 2010), a small selection of his works, is on display.The Royal Academy of Arts Charles Wollaston awards each year artists for a total of £70,000 prize money.